Despite a filmography spanning more than 40 features and short films, including the likes of The Beat My Heart Skipped and The Concert, French actress Melanie Laurent is perhaps best known outside of Europe for performances in the likes of Inglorious Basterds and Now You See Me. Having also helmed several features in France, Laurent has opted for this adaptation of a novel by Nick Pizzolatto for her first English-language release as a director and the result is a somewhat subdued, noirish crime thriller that never fully capitalises on the potential of the story. As is typical of Pizzolatto’s work (he wrote and served as a director/producer on the first series of True Detective), the dialogue is sparse and the characters are damaged, weighed down by the events of the past, only some of which we become privy to as the story unfolds. 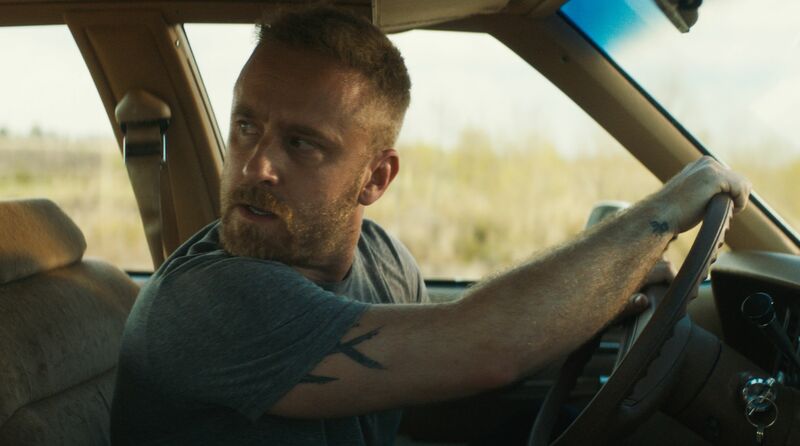 With his previous film (Leave No Trace) criminally ignored by Australian cinemas despite attracting considerable acclaim, it is great to see Ben Foster on the big screen, this time as Roy, a debt collector and standover man working for Stan (a blink-and-you’ll-miss-it-cameo from Beau Bridges), a small-time crime boss with delusions of grandeur. When sent on a job that proves to be a set-up, Roy rescues Rocky (Elle Fanning), a teenage call girl who was being held captive, and the pair skedaddle out of town, making a stopover along the way to rescue Rocky’s little sister Tiffany (played by twins Tinsley and Anniston Price) from the clutches of a sleazy step-father. Insular and inarticulate, Roy’s sense of decency has been awakened by a medical diagnosis that has him seemingly determined to make a difference in somebody’s life before his time runs out. He finds himself conflicted by the feelings of responsibility that wash over him as the unlikely trio reach Galveston and settle into a motel near the ocean, becoming the closest thing to family that any of them have experienced. Needless to say, Roy cannot escape his past and, as is to be expected, tragedy ensues, with the most disturbing act of brutality taking place off-camera, although it is no less impactful because of this. Although the novel is written in first-person, screenwriter James Hammett has constructed a sparse script that doesn’t rely on any voice-over, leaving the viewer to grasp what a character is thinking through their reactions to each other and the events that unfold around them, with Laurent not afraid to let a moment linger a little longer that might ordinarily be the case. Foster (3:10 to Yuma, Hell or High Water) is every bit as effective as we have come to expect from a performer who has made a career out of playing the types of characters that Hollywood A-listers typically avoid. Whilst she has been very impressive in the likes of The Neon Demon and 20th Century Women, Fanning misses the mark here and it is hard to know whether the sense of restraint that hampers her performance comes from her or Laurent. Costume choices are clichéd to the point of making her seem more like somebody playing dress-up and Laurent seems very conscious of the confines of the American censorship regime with regard to sexual content and has seemingly opted for a much more constrained approach compared to what we might expect had the film been made in France. Whilst the emotional contradictions of Roy – damaged and prone to violence but possessing a softer side he struggles to articulate – are not particularly original, Foster is terrific in evoking the torment of his physical and psychological ailments. Both CK McFarland, as the manager of the motel where Roy, Rocky and Tiffany are holed up, and Lili Reinhart (TV’s Riverdale) as the adult Tiffany in a final scene set some 20 years later, are impressive in supporting roles and the cinematography from Arnaud Poiter is elegant without being overt, bringing a sense of realism to the events that play out in a part of America that we rarely see on screen. Both beautiful and harrowing at times, Galveston is slow-burn pulp fiction in which Foster shines despite the dreariness of it all.